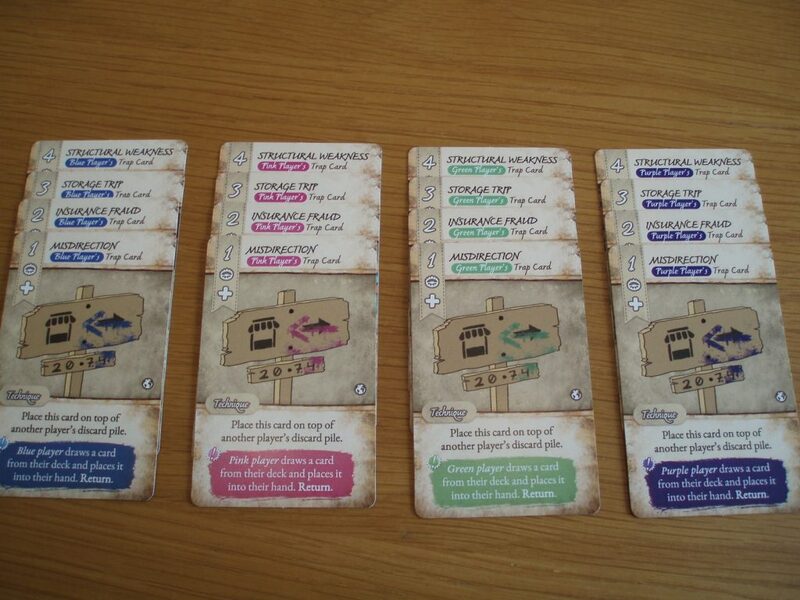 Dale of Merchants Collection is the second sequel to Dale of Merchants and fully compatible with the previous games. Players race to arrange stacks of cards in their market stall, with the first player to build their 8th stack declared the winner. Whilst it’s a game of deck building, it’s just as much about deck dismantling, presenting a constantly interesting dilemma: when do you keep cards for their effects/spending power and when should you lose cards to build stacks? For a more detailed discussion of the gameplay of the series check out Meeple Mountain’s review of the original Dale of Merchants. From here on I will be discussing what Dale of Merchants Collection brings to the table. And what a lot that is! 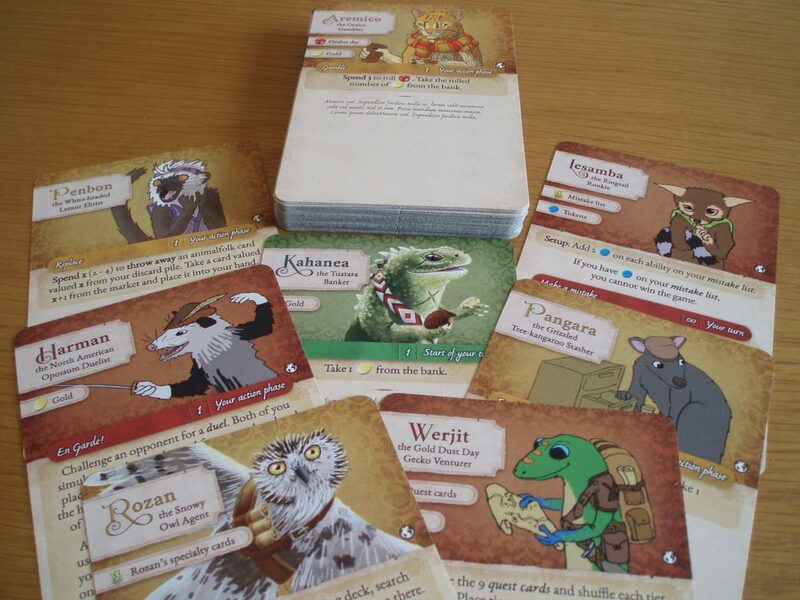 In contrast to the earlier compact card games, DoM Collection provides 8 new animalfolk decks, 55 large character cards with associated effect cards, trap cards, a pile of gold and other tokens, two dice, a clock, a game board and space to store the all current games in the series as well as a future game. Collection is the right word for it. A winning series of stacks, of value from 1 to 8. 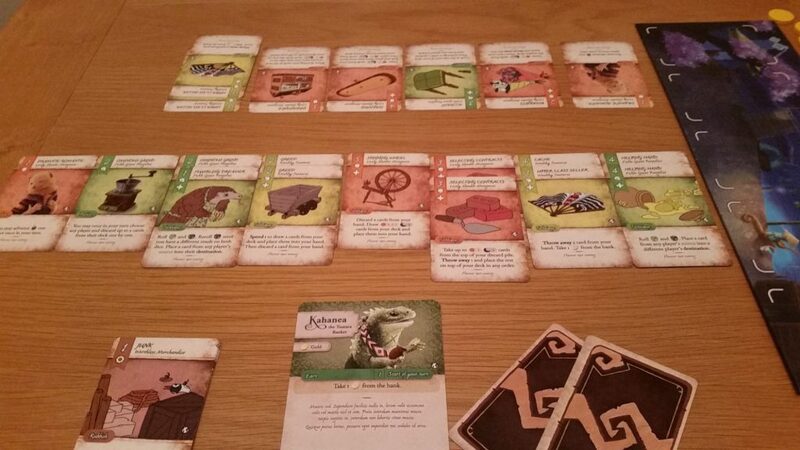 One of the main draws of the Dale of Merchants series is the animalfolk decks. Each deck has its own speciality (card manipulation, stack building etc.) and is themed around its animal type. The new Swindling Black-Headed Gulls for instance love rubbish, allowing you to streamline your deck by sending junk cards out of the game or giving them to your opponents. In a single game you only use a subset of the available decks so 8 new decks provide a great amount of variation for newcomers and boosts the previous 13 decks for those experienced with the series already. The new animalfolk decks. A couple of the colours are a little similar but this is a prototype and may well change by final production. Some of the Enthusiastic Wood Turtle cards act like a payday loan, giving you a boost just when you need it. The trouble is you won’t get the card back until you pay off the loan. It’s an intriguing addition to the game, particularly later in the game when you’re opponents are ahead and you’re deciding whether it’s worth paying to get your turtle card back or not. My wife schooled me with the Vigorous Emperor Penguins the first time we played with them. 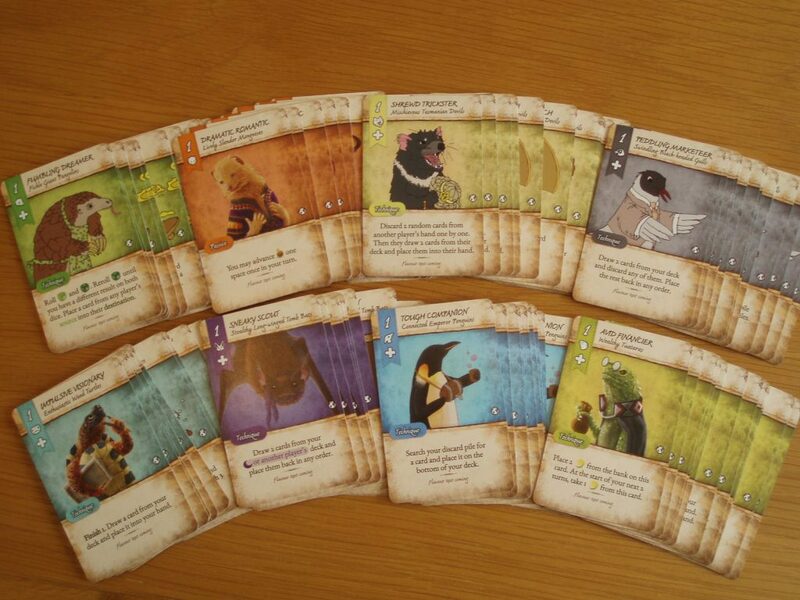 The penguins are very powerful at manipulating card locations and their values… provided you can pay to use them. But if you can manage your deck right then they’ll turn you into a stack-building machine. The Lively Slender Mongooses and Stealthy Long-Winged Tomb Bats both use the clock mechanic, giving players additional abilities when the species are most active (day and night respectively). It’s a great addition to the decision-making process and a beautiful piece of thematic design. How to get beaten by someone wielding the Vigorous Emperor Penguins effectively! None of the decks are complicated but some cards are definitely a bit trickier to get your head around how to use them effectively. I’d be happy to introduce anyone to the original game but a little more hesitant with DoM Collection if players are brand new to modern board games. The Penguins, Tuataras and Gulls feel like the most straightforward for a first game, and the clock mechanic is so intuitive that the Mongooses and Bats feel like the next logical step. Crucially, it’s still a light and quick game .If you’re familiar with modern board games you’ll be absolutely fine and veterans of the series should enjoy the added decision space. However, a consequence of the increased complexity is that some cards have a decent amount of text on them and it can take you a while to read and compare the cards on the market when you’re new to the decks (although this is a prototype and may well change by the time it’s finished). Characters are a completely new addition to the series, providing each player with their own individual ability. At the start of the game players are dealt two characters and pick one of them. The characters come in beginner, intermediate and advanced levels of difficulties and can range from giving a player gold every turn to providing a player with their own quests to complete during the game for bonuses. The characters can break all the rules, they add some fascinating player interaction and are astonishingly inventive. Honestly, it’s fun just sitting and reading through them, even without any artwork on most of the prototype character cards. Dale of Merchants Collections comes with a diverse range of characters (artwork not final). In his design diary Sami Laakso has talked about taking inspiration from the alien races in Cosmic Encounter. It’s an ambitious design goal, yet I think Sami’s succeeded: the characters really work! 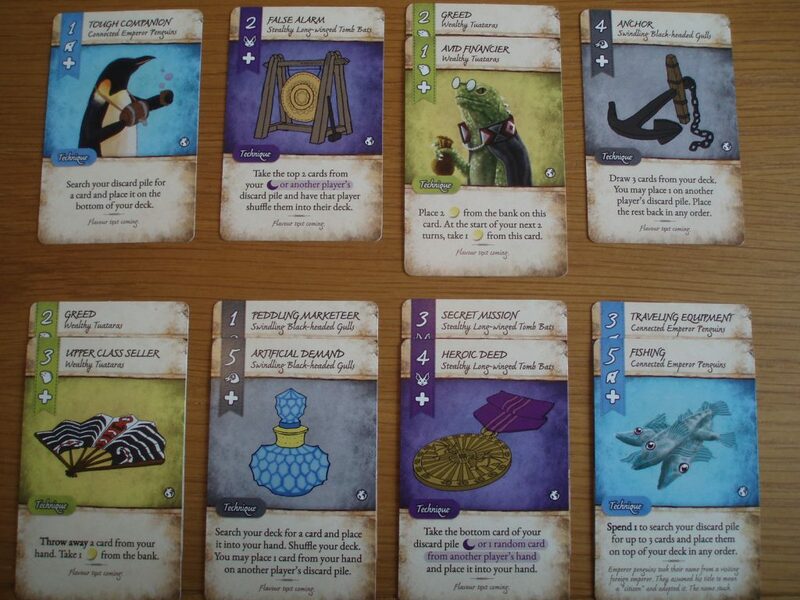 Even without artwork they build on the thematic experience, making you more invested in the game. And some of the effects they add are crazy! Kharimia the Gila Monster Nibbler allows the player to pay to increase an opponent’s venom levels until they’re forced to discard their entire hand. One character runs a pawn shop, whilst another gives you a bunch of personal cards that provide bonuses depending on how many of them are in your discard pile. There are characters that use the various dice of the series, others that use gold or the day/night clock, and some designed for team play. Characters encourage you to complete quests, gamble and even make mistakes! 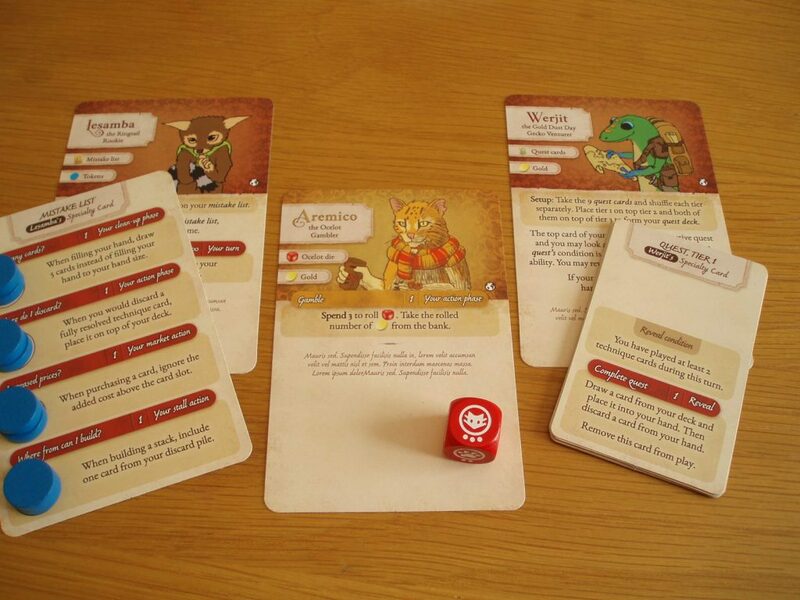 A few characters use dice from earlier games: Aremico requires the Ocelot die from the original Dale of Merchants. The characters are wonderfully thematically and are tremendous fun to play with; they could have been an expansion all on their own. And they add a ton of variability. You may become familiar with the best ways of using each animalfolk deck but the characters add a new dimension. Working out how to best use a character is a new challenge in every game. In fact, the danger is that the characters distract from the central game itself. You’ll be left in the dust if you focus on using your character’s cool ability rather than trying to build the 8 stacks needed to win. Traps can be added to a game to increase the interactivity even further. Players receive the same traps at the beginning of the game, slotting them into their decks like a pistol in a holster. Feel like slowing someone else down? Put a trap on their discard pile… when it cycles into their hand the trap springs! From benign to cruel, the traps are an optional addition to the game. I was initially hesitant about the open antagonism of the traps. I worried they would be too chaotic, too ‘take-that-y’. What I love about them is that of the 4 types of trap available, 2 give you benefits without really hurting your opponent. You’ve clogged up their deck with a card and gained some gold or a card in return. And the more aggressive traps are worth more so do you set them on your opponent or use them for their spending power? These kinds of decision are what make the game interesting for me but the traps inject just a little more conflict if that’s the type of game you feel like. I’m not too sure that they add much in a two player game when there’s only one person to target but they’re great in a three or four player game where it can be hard to keep track of them. They’re particularly good mid-game when they can be lurking in a deck for a while, catching the victim by surprise. 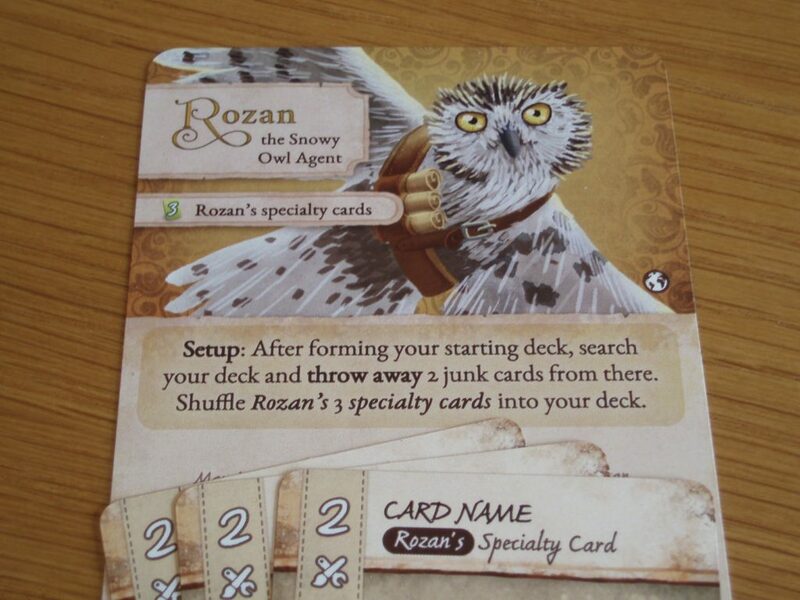 Rozan the Snowy Owl Agent is a great example of the artwork and comes with 3 cards that go into your deck. Hang on – do the Wealthy Tuataras have some form of colonial guilt? They use their inherited wealth for their own gains whilst also acknowledging that it’s tainted money. Perhaps it’s just my interpretation (and of course it could change in the finished version) but that’s a level of depth that’s far more sophisticated than 90% of board games out there. It’s completely unnecessary – all you really need to know is that the Wealth Tuataras provide you with gold – but it enriches the experience ten-fold. It’s an extra maturity to world-building that subtly runs through the whole game. 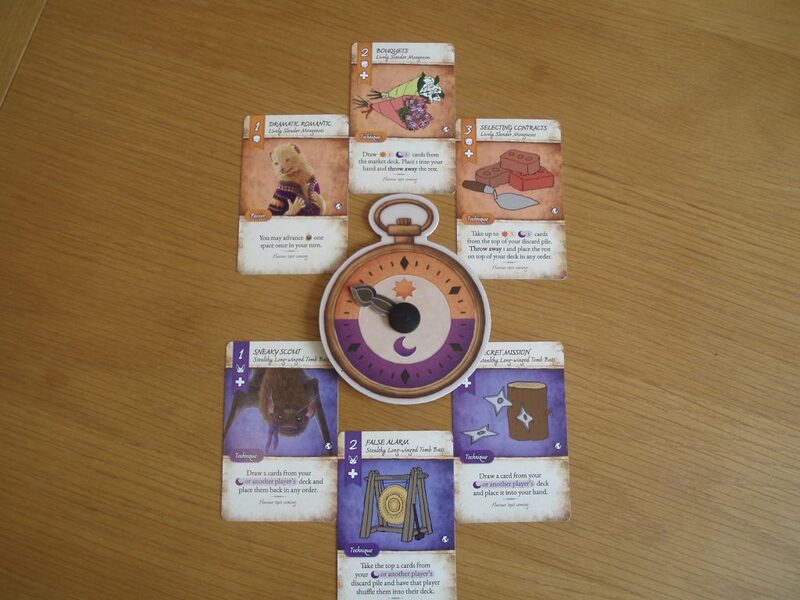 The Mongooses and Bats thematically tied to the clock, their cards allowing you to do different things depending on whether it’s day or night. You might have guessed by now that I’m a fan of DoM Collection. It builds and expands on the earlier games in so many unexpected and exciting ways whilst also being a good introduction to the series. For veterans of the series mixing the new and older animalfolk decks gives you so many options for the type of game you’d like. Some of my best games have blended the simpler early decks with the more ambitious new decks. For new players the collection is a good starting place, though if you have the money I might suggest you get one of the earlier games as well to provide a nice balance of decks. It’s not necessary but it’s a more complete experience in my opinion. 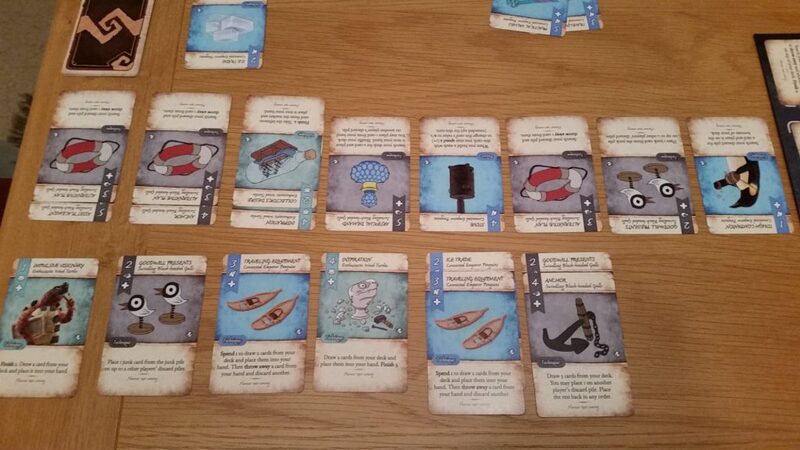 The end of our first game with Dale of Merchants Collection. We emptied the market in our enthusiasm to each try the different cards. When DoM Collection was first announced there was some grumbling that the series was becoming a ‘big box game’. Part of the attraction for some (myself included) was that it was a small, compact card game that packed more punch than its diminutive size indicated. Shelf-space for many is at a premium and there were concerns that the format might not be able to stretch to a big box game. With the characters, wealth of new decks and their diverse mechanics I can confidently say that DoM Collection has earned its larger footprint. It’s definitely one for my collection. Dale of Merchants Collection is currently on Kickstarter here. A prototype version of the game was temporarily provided by Snowdale Design in exchange for an honest review. Previous postLovelace & Babbage – Why Didn’t the Integer Get Airplay? I was happy to get the whole collection pledged on this Kickstarter. Looks like a deck builder that is fun and based on art and theme, one my wife would enjoy playing with me as well.